Detroit Experience Factory — good done daily. An information bureau offering tours and experiences in the city of Detroit. 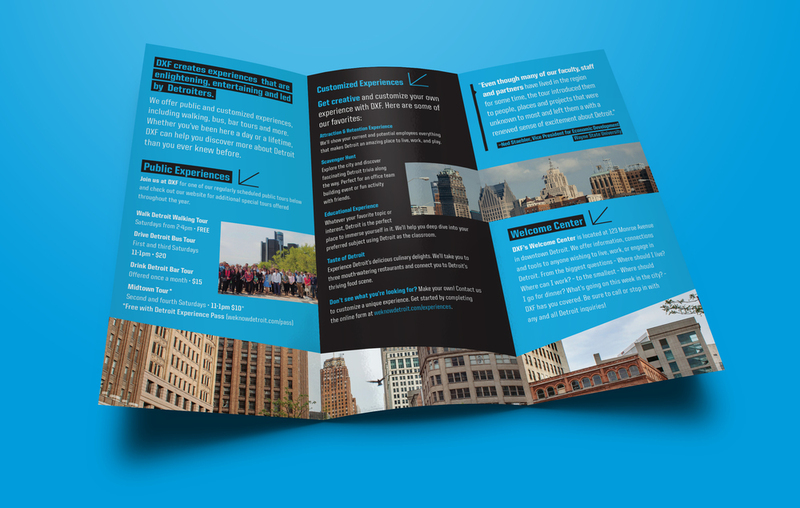 Detroit Experience Factory was founded with the ambition to craft information-rich tours that expose people to Detroit’s many possibilities. In 2015, it opened the city’s first downtown welcome center for visitors to stop in, engage with its staff, and seek local tourism advice. It has since grown its reputation as a major resource hub, leveraging their knowledge to provide companies throughout Southeast Michigan with tours and unique team building activities. The project began with qualitative feedback from staff and former clients. Insights from these conversations provided a foundation for the new logo: a super-symbol that doubled as both a cog and an all-seeing eye. Combined, these icons hint at Detroit’s industrious past, the mobility of the program’s experiential tours, and the act of seeing the city in new and exciting ways. The brand soon manifested through an array of materials including a new responsive website, staff uniforms, maps, environmental graphics, and print matter.